Sean McDonough is a big upgrade IMO. I like Sean McDonough's commentary. Mike Tirico is better as a host instead of play-by-play commentator in my opinion. Do you mean the crew that is completely not understandable? The ones that never annunciate a single word that comes out of their pie-holes? What is Tirico gonna do at NBC? They aren't pushing out Al Michaels are they? IMO he's still far away the best play by play guy working today. 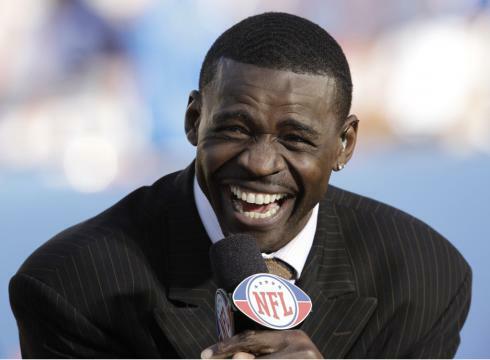 It's laughable how much better him and Collinsworth are than Nantz & Simms. 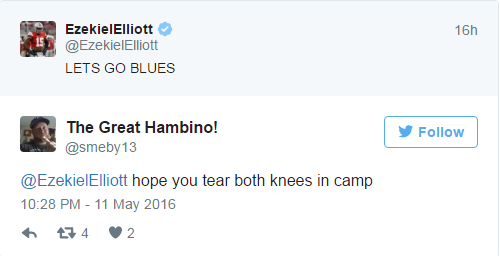 Cowboys 1st round pick, and St. Louis native, Ezekiel Elliot learns a lesson about fans' fickleness. Nantz isn't really the problem in that duo. Simms is awful. Or a lesson as to why not to use that virtual trashcan known as Twitter that has been overrun by dirtbags like The Great Hambino. I really don't understand why a professional athlete would subject themselves to such open scrutiny like this. Well, in this day and age it's a vital marketing tool that both makes pro athletes a lot of money and is crucial to building their brand, etc. For amateur players or guys like Laremy Tunsil, their inner circle should have Twitter banned until they're drafted and have signed a pro contract. For pros, it's an unfortunate necessary evil regardless of how much stupidity/trouble seems to emanate from social media. You're saying that a pro athlete has to have a Twitter account? That is ridiculous. Their play on the field, court, ice should sell themselves. While I'd agree that a pro athlete doesn't have any particular need to participate in twitter, I also think it's quite silly to suggest they shouldn't. I think you need to look into the value of Twitter/social media for pro athletes and celebrities. Some can choose not to, but it's an incredible promotional tool that yes, any star athlete "needs" if they want to maximize their brand. It's annoying, but it's a fact of this generation. I'd be interested to hear what major athlete, especially in their early/mid 20s, doesn't have a social media presence. Wait, what? Percentages really aren't supposed to be a very complicated concept. If you only use active rosters, there are 690 NHL players, meaning anything more than 6 is less than 99%. If you use contracted players, the number is 1500 and anything more than 15 is less than 99%. Jesus Christ I was exaggerating. Still how often to so hear a regrettable tweet from a hockey player compared to the other 3 sports combined? You're making a new argument, though. You didn't say NHL players are less likely to make boneheaded statements on Twitter. I can't quantify that or even disagree. Instead, name me the slew of NHL stars in their 20s who don't have a social media presence on Twitter/Facebook/etc. I don't tweet so I wouldn't know. The only athletes I follow on Facebook are pro skiers. Unless they get into trouble for something they wrote and it goes viral I wouldn't know about it or even care. I used to follow former Giant WR Steve Smith on FB. He was very fan friending and engaging. Everything changed when he signed with the Eagles. The fans got so brutal that he had to shut down his account. That is one of the perils with social media. No one's disagreeing about the perils but you are also underestimating/ignoring the value to pro athletes in terms of the financial rewards or creation of other career opportunities. Whether or not you and I think it's a risky proposition, it is hard to argue against a guy who wants to further his bank account and overall influence by using it. If you followed Twitter a bit more, I think you'd have a better understanding as to why it's basically a must for young, star athletes. Maybe in a less lucrative earning sport like X games athletes (or the pro skiers I follow) I can understand the need for raising your profile on social media. But why bother once you have signed a multimillion dollar deal in one of the 4 major sports or international soccer? I have no idea if Peyton Manning has a Twitter presence but if not I think he is doing fine on his own without it. I forgot, I follow Strahan on FB. Sorry man but you're missing the boat here. XGames? Do you realize the far-reaching impact of Twitter/Facebook/Instagram for pro athletes or other stars in the public eye? For any business venture of their own or that they are lending their name to this avenue is free advertising for their followers which, for young star athletes, can be extremely substantial. It is an open dialogue and thereby an open revenue stream to your fans and potential consumers. Instead of arguing with me about something you admittedly do not understand, why not look at the young stars of "the four major sports" and tell me which do not have a social media presence. That you cannot speaks to why you're simply off base with your assumption. David Ortiz could earn around $3,000 per tweet. It's basically free money for him to pay some bills. They don't need them to make a living. It doesn't mean that they don't like money, especially it just takes them a minute to make it. People said obnoxious things to him, so he exited the conversation. Not really seeing any peril there.